Black4Palestine was proud to sign Labor for Palestine‘s petition in support of the strike, and which called for US labor organizations and workers movements to support the strike and reiterate a call for continued labor/worker solidarity with Palestine. 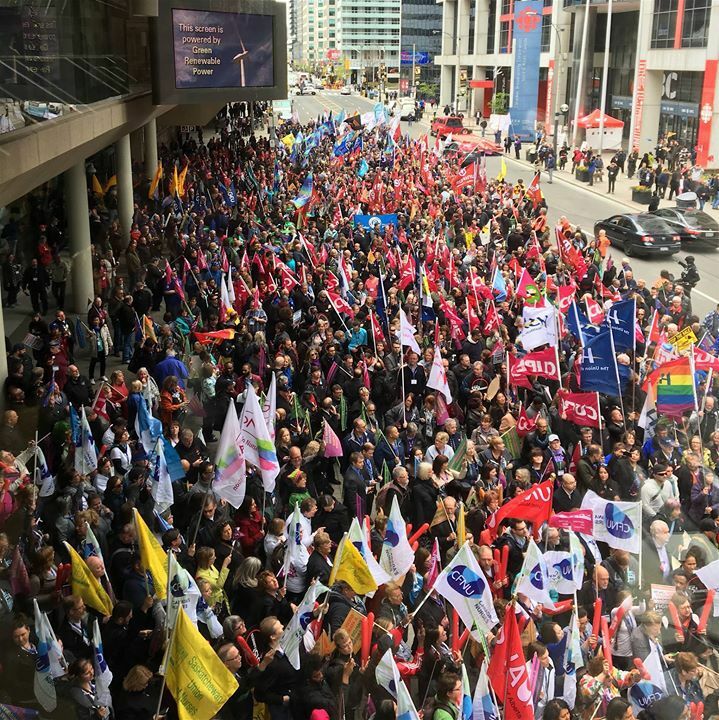 The strikers demonstrated the power of collective action that we must all embrace. Free Speech on Israel, a Jewish-led organisation which defends the right to criticise Israel, and the British Committee for the Universities of Palestine, which campaigns for academic and cultural boycott of Israel, today welcomed the vote by the University and College Union (UCU) to reject the International Holocaust Remembrance Alliance (IHRA) definition of antisemitism. Motion 57, submitted by UCU branches at the University of Leeds, Goldsmiths, and the University of Brighton, along with two strengthening amendments from Queen’s University Belfast and London Retired Members Branch, was carried overwhelmingly in the closing minutes of UCU’s annual Congress in Brighton. Only one delegate spoke against the motion. UCU had previously, in 2011, rejected the “Working Definition of Antisemitism” of the EU Monitoring Centre on Racism and Xenophobia (EUMC). The IHRA definition strongly resembles the EUMC version. Today’s vote strengthens UCU’s existing policy. Both these definitions are considered highly problematic because they seek to conflate criticism of Israel with genuine anti-Jewish racism: examples cited in them make explicit reference to Israel. The UK Government has adopted the IHRA definition, and in February this year Universities Minister Jo Johnson wrote to Universities UK insisting that university activities must respect the definition. In particular, he alleged that “anti-Semitic incidents … might take place under the banner of ‘Israel (sic) Apartheid’ events.” Some universities have banned or curtailed campus events during Israeli Apartheid week or subsequently, and campaigners for Palestinian human rights consider that the definition is being used to censor legitimate political activity and debate which criticises the Israeli occupation and human rights abuses. In moving the motion, Mark Abel of Brighton UCU noted that an event organised by Friends of Palestine had been cancelled by the University of Central Lancashire, who cited the IHRA definition as making the event ‘unlawful’. Reacting to this wave of censorship the new, Jewish-led organisation Free Speech on Israel, along with Palestine Solidarity Campaign (PSC), Independent Jewish Voices, and Jews for Justice for Palestinians, obtained a legal Opinion from the eminent human rights lawyer Hugh Tomlinson QC. The Opinion is devastating: it characterises the IHRA definition as confusing, not legally binding, and putting public bodies that use it at risk of “unlawfully restricting legitimate expressions of political opinion”. A public body that bans a meeting under the IHRA definition without any evidence of genuine antisemitism could be breaching the European Convention on Human Rights which guarantees freedom of expression (Article 10), and freedom of assembly (Article 11). UCU Congress also passed a motion in support of Professor Kamel Hawwash, a UCU member at the University of Birmingham, who was prevented from entering Israel on 7th April on a trip with his wife and young son to visit relatives in occupied East Jerusalem. It seems likely that Prof. Hawwash was banned under the new Israeli boycott law, which prevents activists accused of supporting BDS (Boycott, Divestment and Sanctions) from entering Israel. Prof. Hawwash was until recently the vice-chair of PSC. The General Secretary of UCU will now be writing to the Israeli Embassy and the FCO to urge that the ban on Prof. Hawwash and all non-violent human rights campaigners be lifted. The legal opinion from Hugh Tomlinson QC, obtained by PSC and other groups, characterising the IHRA definition as confusing, not legally binding, and putting public bodies that use it at risk of ‘unlawfully restricting legitimate expressions of political opinion’. the importance of open campus debate on Israel/Palestine. Congress resolves that UCU dissociates itself from the IHRA definition and will make no use of it (eg. in educating members or dealing with internal complaints). lobby government to seek a review of its endorsement of the IHRA definition and to replace it with one that will both protect free speech and combat anti-semitism. 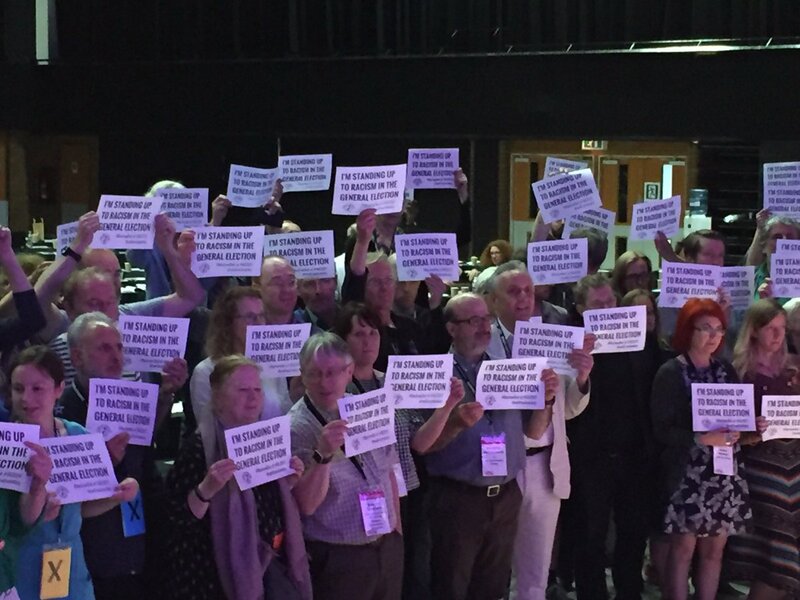 Recalling the experience of Fraser vs UCU, we call upon the NEC to take a position against any university management that reacts to spurious accusations of anti-semitism by banning speakers who are opposed to the policies of the state of Israel but who have not in any way expressed racism against Jewish people. 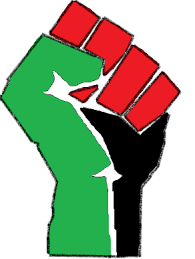 We salute the striking Palestinian prisoners, and thank all who have stood in intersectional solidarity with them! It is clear for us that the struggle against colonialism cannot be separated from the social injustices within Palestinian society. What does it mean to end my subjugation by Moshe for it to be replaced by Munir? What kind of liberation are we seeking? What kind of a society are we trying to build? On the hot afternoon of April 19, 2016, thousands of workers and unemployed took to the streets of the West Bank city of Ramallah in protest the labor policies of the Palestinian Authority (PA). As the sun beat down on their shoulders, the marchers remained defiant, shouting “Haramiyya! (Thieves! 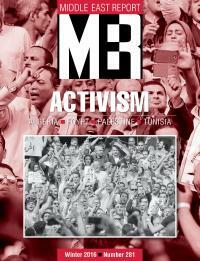 ),” as they reached the rally point in front of the Council of Ministers and Ministry of Interior buildings. Organizers from independent workers’ movements, left political parties and women’s committees took turns addressing the crowd from a makeshift platform on the back of a truck. PA police and security forces were deployed, some in riot gear and armored vehicles, but they did not visibly interfere. The demonstration was the first public, collective manifestation of a campaign against Social Security Law 6, ratified by decree on March 9, 2016 by President Mahmoud ‘Abbas. The opposition to the social security law is led by newly formed independent workers’ movements and their allies in civil society. Their campaign follows closely upon wildcat strikes by perhaps 30,000 teachers in February and March of 2016. Both efforts are emblematic of Palestinian workers’ growing rejection of the package of neoliberal economic nostrums on offer from the PA in lieu of an end to Israeli settler-colonial rule. In 1997, after the Palestinian Legislative Council (PLC) released a report on corruption among PA ministers, President Yasser Arafat infamously quashed judicial action against the accused, telling legislators: “We will worry about our internal problems—the questions of social justice within Palestine—after we fight colonialism, our common enemy.”  This injunction is recited still by officials in the PA and its affiliated labor federations, as well as some outside supporters of the Palestinian cause. But the social and colonial questions in Palestine are co-constituted. 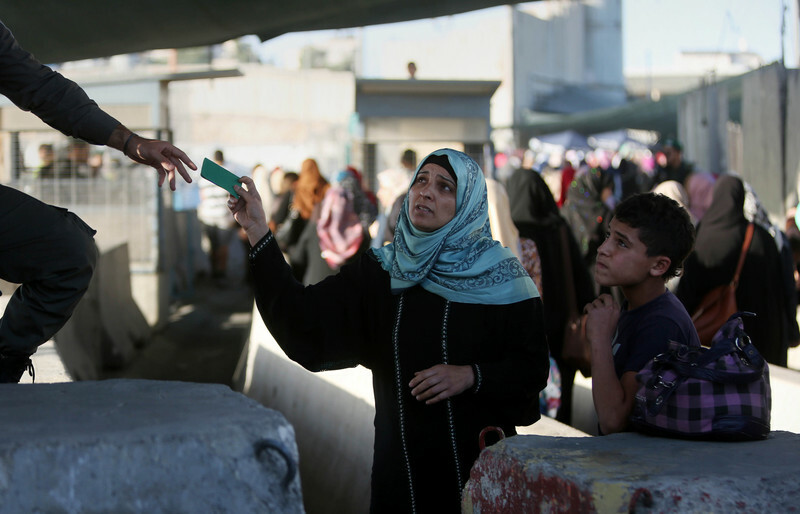 To separate the occupation from injustices in Palestinian society is to conceal the complex relations between capital accumulation and class transformation, the PA’s authoritarian practices, and Israel’s colonial project. An understanding of these relations is crucial for those committed to transnational solidarity with Palestine. Social Security Law 6 is part of a program of economic shock therapy that began in 2007. The PLC has not formally convened since late 2006, so all of these laws were drafted or amended by presidential decree with limited public disclosure. The new independent unions and workers’ committees see a multi-front attack on labor reflecting the demands of big business. 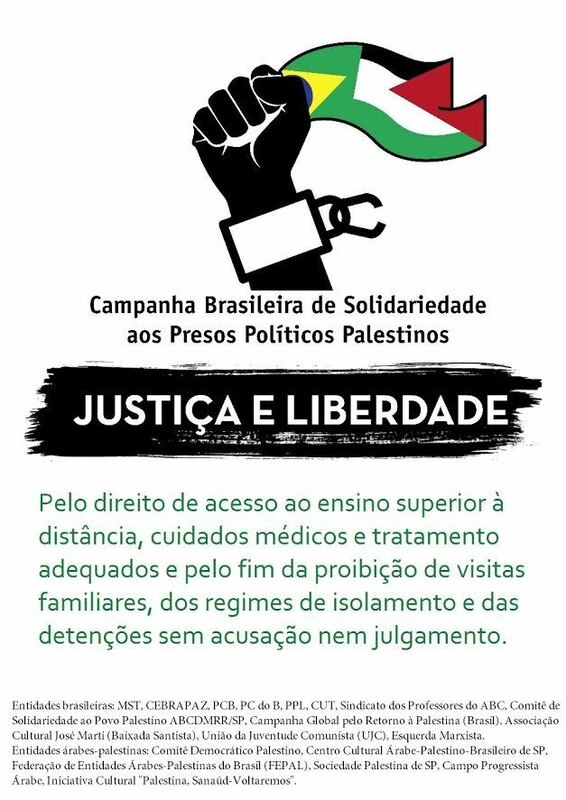 The following statement was released by a new Brazilian alliance to support the Palestinian prisoners, as 1500 of the 6500 prisoners carry out their hunger strike, the Strike of Freedom and Dignity, in Israeli jails. The statement was released by a broad alliance of Brazilian organizations and Palestinian and Arab community groups in Brazil, including the country’s leading trade union center, CUT; the mass popular movement, MST (Landless Workers’ Movement); and a number of left political parties, Palestine solidarity groups, Palestinian community centers and associations, and international solidarity movements. Samidoun Palestinian Prisoner Solidarity Network salutes these Brazilian organizations, mass movements, labor organizations and Palestinian and Arab community groups for their solidarity with Palestinian prisoners, especially at a time when popular and progressive movements in Brazil are themselves under attack and facing repression, imprisonment and arrests, and when popular marches and demonstrations are confronted with tear gas, rubber bullets and police and military assault. We stand in solidarity with the Brazilian people’s struggle against the violence of the Temer government and its attacks on the people, and look forward to struggling together to defend peoples’ rights. PALESTINIAN POLITICAL PRISONERS ON HUNGER STRIKE. São Paulo, Brazil, May 22, 2017. Since April 17, around 1580 Palestinian political prisoners have engaged in a hunger strike for a number of demands, including the freedom of the sick prisoners, the elderly, the women prisoners and the more than 300 Palestinian children. They also demand dignified treatment, the right to study and to be visited by their relatives, and the end of administrative detention, inherited from the British Mandate, in which a prisoner can be detained for six months without any charges with the possibility of indefinite renewal of their detention, making any legal defense difficult to impossible. The Israeli government holds 6500 Palestinian prisoners. They are political prisoners, who have fought against Israeli colonialism and against the aggression and occupation of their lands since May 15, 1948, the day called by the Palestinians “al Nakba”, meaning “The Catastrophe”. On that day, terrorist groups belonging to the zionist movement (a colonialist and racist movement) unified and proclaiming the birth of “The State of Israel”. Until 1918, Palestine was occupied by the Ottoman Empire. Between 1918 and 1948 it was occupied by the British troops. Palestinian prisoners are fighting for freedom, national independence, sovereignty and self-determination, their rights assured by the Charter of the United Nations (UN). They are also struggling for a just peace and for the Palestinian people to live in freedom, dignity and humane conditions of life and labor for all of their people. The government of Israel is the world champion in disrespecting human rights and UN Resolutions. Israel and its colonialist/expansionist policies never allowed for the existence of the State of Palestine. Israel has occupied Palestinian lands in 1948/1949 and in 1967 expanded their occupation. Over the 1970s, 1980s and 1990s they kept expanding into Palestinian territories. Even after the “Oslo I Accord” (1993/1994), Israel continued violating rights, building illegal settlements in the West Bank, displacing Palestinians and demolishing houses in Jerusalem, and building the wall of segregation on Palestinian land. Jerusalem, the capital of the State of Palestine is occupied by Israeli colonialism since June of 1967. Progressively, the zionist state advances over the Palestinian people, surrounding and isolating their very existence. The Palestinian political prisoners are the most heroic expression of the aspirations of the Palestinian people, who have never given up on the struggle for a free, just, democratic and independent homeland. The prisoners have always been an example of resistance and national unity against zionism and imperialism, and they know that in order to defeat Israel, the collective and active participation of the people and their legitimate organizations as a whole are needed. They unite the people in a single cry of justice and freedom. We, Brazilian men and women, members of working class organizations, youth and students, members of political parties, labor unions, popular movements and solidarity committees, unite with the societies of the Arab and Palestinian community to spread and support the just cause of the Palestinian political prisoners on hunger strike. Following their example, we unite to create the Brazilian Campaign of Solidarity to the Palestinian Political Prisoners (CBSPPP, in Portuguese), a unitary action already mobilizing on the streets of Brazil. We demand the zionist entity to respect and implement the prisoners’ just demands. We also demand that it implement the UN Resolutions on the Palestinian cause, such as Resolution 194, which guarantees the right of return for Palestinian refugees. We also demand the immeidate withdrawl of the occupation forces to the borders of June 4, 1967 and that they leave Jerusalem, ending 50 years of military occupation. We demand the fall of the wall of shame and the end of the genocidal, ethnic cleansing and apartheid policies that have characterized all Israeli governments. Israel and its leaders must answer for their decades of crimes against the Palestinian people in international courts. 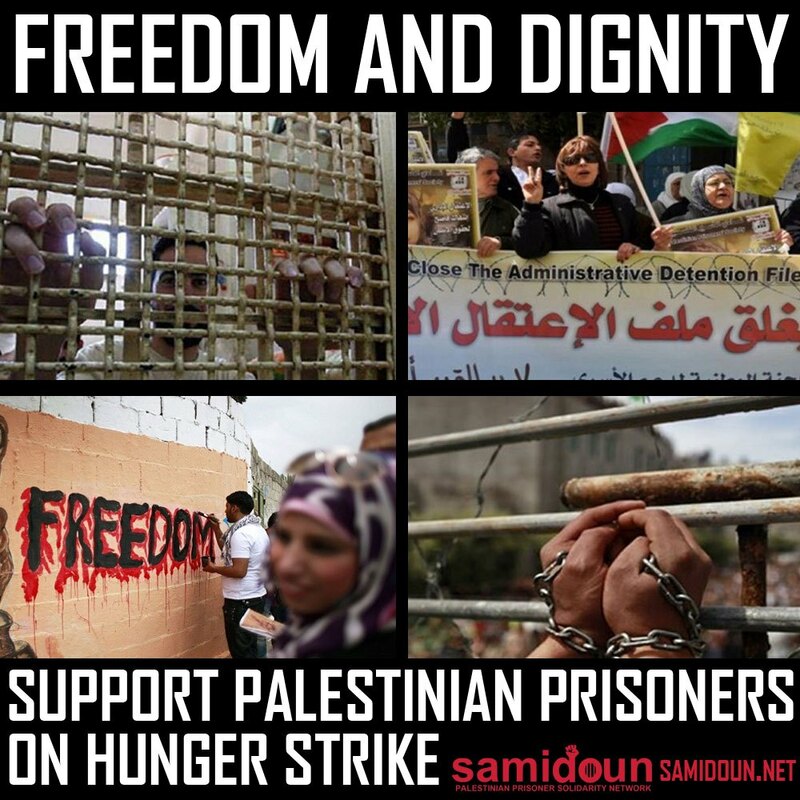 We must defend the lives of the Palestinian prisoners on hunger strike. Israel wants their death! We want them to live in dignity and to conquer freedom bravely. Nothing and nobody can restrain a people’s march towards their liberation! Victory shall come, and together all around the world, we will celebrate the defeat of colonialism, racism and imperialism in Palestine! AGAINST ISRAELI COLONIALISM! LONG LIVE THE STRUGGLE OF THE PALESTINIANS! THE BRAZILIAN PEOPLE SUPPORT THE PALESTINIAN PRISONERS’ HUNGER STRIKE! ” في السابع عشر من أبريل دخل أكثر من 1580 أسير سياسي فلسطيني في الإضراب عن الطعام من أجل تحقيق العديد من المطالب ومنها حل مشكلة الأسرى المرضى، والقدامى، والنساء، ووجود أكثر من 300 طفل فلسطيني في السجون، والمطالبة بالمعاملة الإنسانية، والحق في الدراسة، والسماح لزيارة الأهل والأقارب، إضافة إلى إنهاء الاعتقال الإداري هذه السياسة التي ورثوها من الانتداب البريطاني، والذي يفرض على الأسير الاحتجاز بدون أي تهمة مع إمكانية تجديده مما يصعب الدفاع عنه قانونياً”. ” ما زالت الحكومة الإسرائيلية تعتقل أكثر من 6500 أسير وأسيرة فلسطينية والذين هم أسرى سياسيون ناضلوا ضد الاحتلال الإسرائيلي والقمع واحتلال أراضيهم منذ 15 مايو 1948 ( النكبة)، حيث قامت في هذا اليوم مجموعات إرهابية تنتمي للحركة الصهيونية ( حركة استيطانية عنصرية) بالتوحد وإعلان قيام دولة ” إسرائيل”، ففلسطين كانت محتلة من قبل الإمبراطورية العثمانية حتى عام 1918، وفي الفترة ما بين 1918 و1948 كانت فلسطين تحت الانتداب البريطاني”. الأسرى الفلسطينيون يناضلون من أجل العودة والحرية والاستقلال وتقرير المصير، هذه الحقوق التي أقرها الميثاق التأسيسي للأمم المتحدة، ويناضلوا من أجل تحقيق السلام العادل، وأن يعيش الشعب الفلسطيني بحرية وكرامة وظروف معيشية إنسانية. الحكومة الإسرائيلية تحتل المرتبة الأولى عالمياً في انتهاك حقوق الإنسان وقرارات الأمم المتحدة، هذا الكيان وبسياساته الاحتلالية التوسعة لم يسمح أبداً بقيام دولة فلسطين، حيث قامت باحتلال الأراضي الفلسطينية في 1948 وفي عام 1967 واستمرت في قضم الأراضي الفلسطينية في أعوام (90، 80، 70) بالرغم من اتفاقية أوسلو في عام 1993/1994 واصلت “إسرائيل” انتهاك الحقوق وبناء المستوطنات غير الشرعية في الضفة الغربية، وقامت بطرد الفلسطينيين وهدم المنازل في القدس، وبناء الجدار العازل على الأراضي الفلسطينية، وما زالت القدس عاصمة دولة فلسطين محتلة من قبل الاحتلال الإسرائيلي. الأسرى السياسيون الفلسطينيون هم التعبير البطولي لطموحات الشعب الفلسطيني الذين لم يتخلوا أبداً عن النضال من أجل وطن حر وعادل ديمقراطي ومستقل، وهم كانوا دوماً مثلاً في المقاومة والوحدة الوطنية ضد الصهيونية والامبريالية، وهم على يقين أن النصر على المحتل يحتاج إلى الالتفاف الجماهيري، والمشاركة الفعالة لكل شرائح الشعب الفلسطيني بمؤسساته وهيئاته الشرعية تحت شعار العدالة والحرية. نحن البرازيليون أعضاء في منظمات عمالية ونسائية وشبابية وطلابية، وأعضاء في أحزاب سياسية ونقابات وحركات اجتماعية ولجان تضامن نضم صوتنا إلى صوت الجاليات العربية والفلسطينية لنشر ودعم قضية الأسرى الفلسطينيين العادلة في معركة الأمعاء الخاوية التي يخوضونها، من هنا وبالتزامن مع إضراب الأسرى توحدت الجهود للإعلان عن إنشاء الحملة البرازيلية للتضامن مع الأسرى السياسيين الفلسطينيين والتي باشرت في تنظيم فعاليات في الشوارع البرازيلية. نطالب الكيان الصهيوني أن يلبي مطالب الأسرى العادلة، كما نطالبه بالالتزام بقرارات الأمم المتحدة فيما يتعلق بالقضية الفلسطينية كقرار 194 الذي يضمن حق العودة للاجئين الفلسطينيين، ونطالب أيضاً بانسحاب الاحتلال فوراً إلى حدود الرابع من حزيران 67 والانسحاب من القدس وإنهاء 50 عاماً من الاحتلال العسكري، كذلك نطالب بإزالة جدار الفصل العنصري ووقف سياسة الإبادة الجماعية والتطهير العربي والتمييز العنصري التي تميزت بها الحكومات الإسرائيلية المتعاقبة، ويجب محاسبة حكومة ” إسرائيل” وقادتها في المحاكم الدولية على عقود من الجرائم ارتكبتها بحق الشعب الفلسطيني. سندافع عن حياة الأسرى المضربين عن الطعام الذي لم تأبه “إسرائيل” بإضرابهم حتى لو كان الموت نهايتهم، نريد لهم العيش بكرامة وأن يحققوا مطالبهم وإطلاق سراحهم فوراً، لا أحد يستطيع وقف نضال شعب يطالب بحريته، فالنصر قادم ونحن والعالم سوف نحتفل بهذا النصر على الامبريالية والصهيونية في الأراضي الفلسطينية. نحن سنكون دائماً ضد الاحتلال الصهيوني! الشعب البرازيلي يساند الأسرى الفلسطينيين في معركة الأمعاء الخاوية! الحملة البرازيلية للتضامن مع الأسرى السياسيين الفلسطينيين. المركز البرازيلي للتضامن مع الشعوب والنضال من أجل السلام. المبادرة الثقافية – فلسطين – سنعود. Labor for Palestine joins workers around the world to stand with 1,500 Palestinian prisoners who have been on hunger strike since April 17 to protest conditions that Amnesty International calls “unlawful and cruel.” After more than a month, their health is failing, but their steadfastness remains unshakable. From workers’ rights and women’s rights, to anti-racism and anti-colonialism, hunger strikes are a time-honored form of protest against injustice. But the Israeli government — which receives $3.8 billion per year in U.S. weapons and closely coordinates with the same police agencies that systematically terrorize Black and Brown communities in the United States — threatens to force-feed the strikers, and is gunning down their supporters in the streets of Palestine. Such relentless state violence reflects the continuing Nakba, Israel’s 69-year-old ethnic cleansing campaign against the Palestinian people. Norway’s largest and most influential trade union organization has called for a full boycott of Israel. 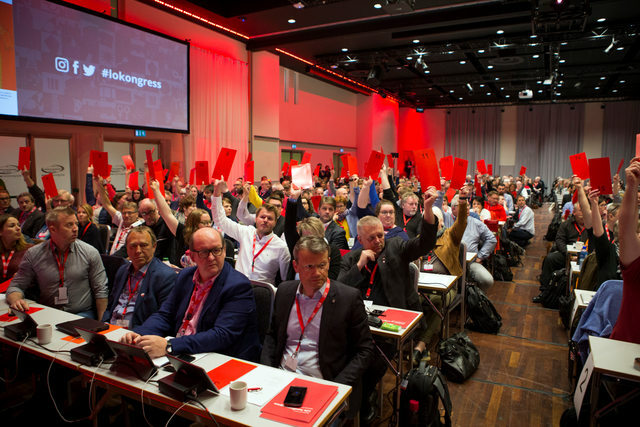 Last Friday, the Norwegian Confederation of Trade Unions (LO) voted to endorse a statement that embraces the entire slate of demands in the Palestinian call for boycott, divestment and sanctions (BDS). The Palestinian BDS National Committee hailed the decision as courageous and urged LO to pressure the Norwegian government to end military ties with Israel. Sara Bell, leader of the Norwegian Union of Municipal and General Employees in the city of Bergen, was a key organizer among those putting the boycott on LO’s agenda. “I think the result reflects ordinary Norwegian people’s understanding and rejection of the horrible injustices the Palestinian population has been suffering for far too long,” she added. The primary debate at the LO congress was not over whether to boycott, but how. LO president Hans-Christian Gabrielsen had urged only a boycott of goods from Israeli settlements in the occupied West Bank. He warned that adopting the full boycott could prevent LO representatives from traveling to visit Palestinian trade unions, due to a new Israeli law that bars entry to BDS supporters. However, that law does not distinguish between boycotts limited to settlements and broader boycotts of Israel. A boycott of settlement goods had already been adopted at a previous LO congress. And, LO’s newspaper FriFagbevegelse reported earlier in May that two LO members have already been denied entry by Israel this year because of their Palestine solidarity activism. Gabrielsen also argued that a full boycott would hurt Palestinian workers and labor unions. This claim was blunted by the fact that the BDS call has been endorsed by the Palestinian trade unions federation PGFTU. Its general secretary Shaher Saad also spoke at the LO congress. “We are a people who need help and solidarity from our friends, and we need it now,” Saad said. Like many LO leaders, Bell has visited Palestine, most recently traveling to the Gaza Strip in March with a union delegation. Bell told the LO congress about Abd al-Rahman Wahdan, a potato farmer from Beit Hanoun, in northern Gaza. During Israel’s 2014 assault on Gaza, Wahdan’s house was occupied by Israeli forces for three days, Bell told the congress. Some family members fled to Jabaliya refugee camp, others stayed in Beit Hanoun. Eight were killed by a bomb in Beit Hanoun and four others by airstrikes in Jabaliya. Today, Wahdan farms potatoes close to the no-go zone enforced by the Israeli military inside Gaza near the boundary with Israel. Bell said her union helps fund irrigation systems for Wahdan and other growers in the area where farmers are frequently shot at by Israeli forces and have their crops sprayed with poison by Israeli aircraft. Criticism was swift and predictable. Foreign minister Børge Brende tweeted that Norway’s current right-wing government “strongly” opposed the LO’s decision. “We need more cooperation and dialogue, not boycott,” Brende wrote. In January, during a visit to Israel, Brende signed an agreement on scientific cooperation with Prime Minister Benjamin Netanyahu. But solidarity activists are welcoming the vote as a sign of change. “Such popular resistance from the grassroots of the Norwegian labor movement shows just how out of sync with the public both Norwegian and international politicians are in allowing Israel impunity against human rights and international law violations,” Tora Systad Tyssen, chair of the Association of Norwegian NGOs for Palestine, told The Electronic Intifada. And on 9 May, days before the LO congress vote, the municipality of Lillehammer passed a resolution to boycott Israeli settlement goods. 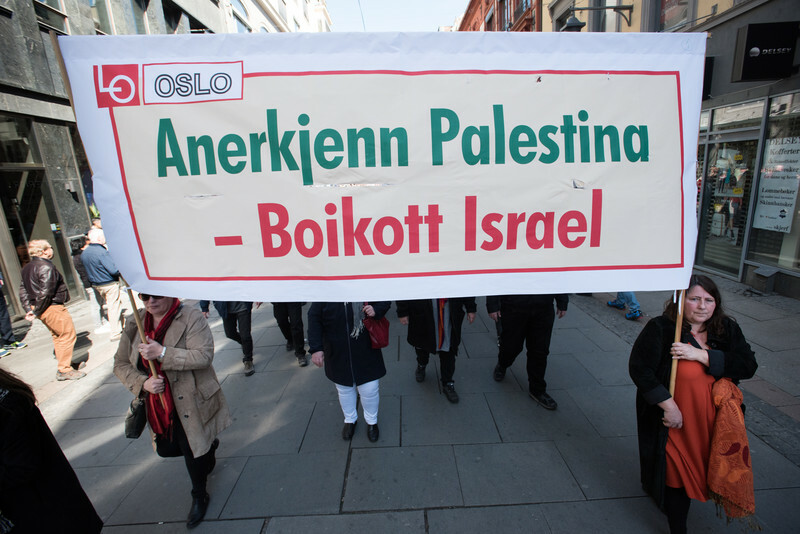 This made it the third major city in Norway to call for a settlement boycott, following Trondheim and Tromsø. May 12, 2017 – Today, the Norwegian Confederation of Trade Unions (LO), representing close to one million workers, endorsed a full boycott of Israel to achieve Palestinian rights under international law. LO is the largest and most influential umbrella organization of labor unions in Norway. The Palestinian Boycott, Divestment and Sanctions National Committee (BNC) salutes the Norwegian Confederation of Trade Unions (LO) for endorsing a full “international economic, cultural and academic boycott of Israel” as a necessary means to achieve Palestinian fundamental rights, including the right of return for the refugees and equality for Palestinian citizens of Israel. By courageously heeding the Palestinian BDS Call, issued by an absolute majority in Palestinian civil society in 2005, LO joins some of the world’s most important trade union federations, including South Africa’s COSATU, Brazil’s CUT, Quebec’s CSN and the Irish ICTU, in calling for meaningful BDS pressure on the corporations and institutions that have enabled decades of Israeli occupation, settler-colonialism and apartheid. The BNC hopes to closely coordinate with Norwegian partners within LO, particularlyFagforbundet, to translate this new policy into effective measures of accountability at the academic, cultural and economic levels to uphold human rights and international law. We also call on LO to apply pressure on the Norwegian government to end all its military ties with Israel’s regime of oppression and to divest its sovereign fund from all companies that are complicit in Israel’s occupation and illegal settlement enterprise.